A Tribute to our Import Manager – Caroline Lambe celebrating 36 years of outstanding service to Emerald Freight Express. Please join us as we celebrate with our Import Manager – Caroline Lambe as September 20th marks her 36th year of service with Emerald Freight Express. In those early days we were all multi-taskers, so Caroline also served on our Export team with distinction. In those early days every task was manual. Import entries were hand-written and produced in triplicate using carbon paper. Paperwork before being hand carried to the Customs House in Dublin City or to the Cargo Terminal at Dublin Airport. While pre-automation had its drawbacks life and business in general moved a slower pace, it was a much more personal environment for everyone concerned. Consequently there were lots of opportunities to meet people face to face at the Cargo Terminal such as Customs officers and many other employees in our industry working for competitors and Airline staff with: Aer Lingus, British Airways, Lufthansa, Iberia Northwest Airlines and Air Canada. This is where one’s true character was established and friendships and reputations were made for the long term, to last a lifetime. Caroline made her mark and as such she is highly respected in our Industry by so many people here in Ireland and across the Globe. The telephone was also the main means of communication with Clients, Carriers and overseas agents. This was another opportunity to express one’s personality and build strong business relationships which proved mutually beneficial. Verification was mainly reliant on the Telex tele-printer operating on a SIATA System so if you chose to have back up in writing for the record, this was your ‘’belt and braces’’ safeguard. This was followed by the Fax Machine as our Global Industry expanded and developed rapidly, before the ultimate introduction of computerisation, in our Industry during the late 1980’s. Like every industry this was the technological revolution and Caroline was at the forefront of our drive to get on board this fast moving automation process moving from ground zero to embrace the internet evolution for Emerald Freight Express. So with Caroline’s help we moved on to EDI applications, Electronic filings and transmission of data to Customs and the Airlines + Ocean Carriers. 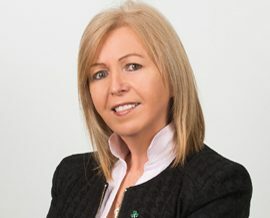 As our Import Manager, Caroline was instrumental in driving our AEO accreditation with Irish Customs/ Revenue. This credential was obtained in 2011 and stands to the credit of Emerald Freight Express to this day. So on the occasion of her 36th work anniversary with Emerald Freight Express let’s congratulate Caroline on her fantastic achievements down thru the years.